As they say, breakfast is the most important meal of the day. To wake up your taste buds, you’ll indulge in New Orleans’ most iconic breakfast pastry, the beignet. While it looks hard to pronounce, it’s definitely not hard to love. Just make sure you watch the direction of the wind or else you might find yourself covered in powdered, sugary goodness! 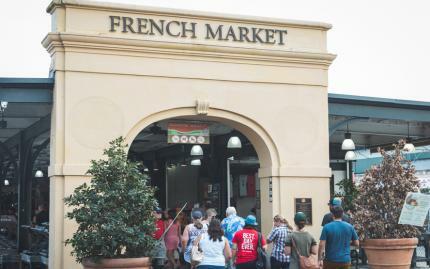 Next, head to The French Market, the site of America’s oldest public market. Historically a place of diversity with products and people from all walks of life, today The French Market is a modern yet unique culinary space. You’ll be sure to stop for a local bite and get to know some of the colorful personalities who call this city home. Finally, finish off with a sweet treat made from locally grown sugarcane and the region’s abundant pecans. No room for more? Don’t worry, they don’t call it the Big Easy for nothing. You can take your praline to-go and indulge when your sweet tooth kicks in. Note: Food options and portion sizes will vary depending on the season and where the tour stops that day but the total amount of food included will be equal to a full meal.